Olympic team boss Dave Brailsford led a bunch of British Cycling coaching elite out on to the top of the world on Tuesday. 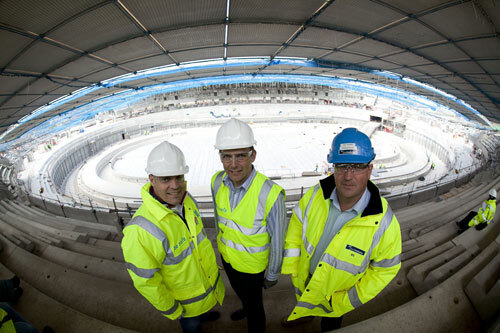 Or to be more precise, on to the still-to-be-completed roof of the 2012 London Olympic Velodrome! It was a treat, certainly, but also symbolic, a nice piece of PR, to bring the coaching staff into the heart of this temple to our Olympic aspirations. The visit was arranged by The London Organising Committee of the Olympic Games and Paralympics Games (LOCOG) and included a tour (in two mini-buses) of the entire Olympic Park connected by bridges across the banks of the River Lea, saving the best to last, a walkabout at the velodrome as finale. As well as Brailsford, the party included Richard Arnold, the Olympic Delivery Authority project sponsor acting as tour guide, Simon Lillistone the former international trackie now LOCOG Cycling Manager and, among the coaches former internationals Keith Reynolds, Mark McKay and Doug Dailey. It was entirely appropriate, too, for Doctor Steve Peters, British Cycling’s psychiatrist to be in the party. The man who helps Olympians conquer fear might find himself on call prior to the roof walk. “Bit different to Bootle,” quipped Dailey – a typical Scouse understatement – a reference to the pre-War Liverpool track he raced on as a junior in the 1960s. We walked first into the track centre as tower cranes worked overhead. A blast on a whistle warned helmeted workers and visitors of each crane movement, as another section of the roof was swung into place. 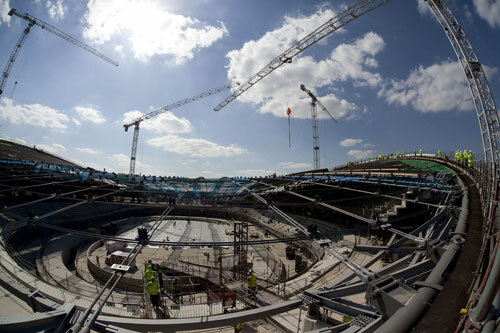 From there it was into the lower terraces of the 6000-seater velodrome. We could look out from the gallery – unique to the usual all enclosed velodrome design – in that it will serve to let natural light in and people to look out. The spectacular view takes in the rest of the Olympic Park and the London skyline a few miles away. Then it was up into the Gods, to the top terraces to obtain a superb view of the 250-metre bowl below, a concrete channel as yet, awaiting the timber track to be fitted later this year. Then finally, we trod a narrow metal stairway of scaffolding poles up and out into the fresh air high above the track, to the gangway, a mini-banked walkway around the entire edge of the roof. The roof, consisting of 1,300 timber and plywood cassettes fixed to the huge spiders web of cables criss-crossing the stadium, was about half complete. It was on to these our party walked, a sort of topping out party minus the beer. Nice bit of flex, noted those who jumped lightly up and down on it! There was excitement tinged with trepidation as workers grinned and looked on. Brailsford told me why he arranged the trip. “We try to get together with the staffing team twice year and I thought, two years out from actual Games themselves, I thought this would be a good idea. “There’s nothing more to sharpen the minds, if you like, than coming down and seeing the building’s up, the work being done, the actual venues where will all be competing, where the athletes will be staying. “I think it’s important that we get that real focus and determination and there’s nothing better than standing in the nearly completed velodrome and thinking right, this is where we are to win, lose or draw. “It’s important because it’s easy to go to work everyday at Manchester Velodrome and go through the motions. So coming here is a stark reminder of, right, this is the theatre where we will be expected to perform. Here are the stages being built where the actors will have to perform. It’s real. It’s going to happen. “And everything that we do every day needs to be focused on getting that delivery right. “So I thought this will be a nice moment in time to be able to come down and check out what was going on and really try and get that mindset right for the next couple of year. ”To see the guts of the velodrome, see the BMX Park next to it, the Aquatic Centre, to see the magnitude, the scale of the Olympic Park, I think it really does bring it home. And I think that is very, very important.